I've discovered Malva - a lovely plant with pretty mauve flowers and lovely leaves. I bought a packet of seeds as flowers for my garden two years ago and sown them by the fence. They didn't really begin to flower until the fall. Then they didn't want to die when the rest of the garden quit and browned off for the winter. Last year these malva plants showed up as volunteer plants ranging further away from the fence. Somewhere I spied some mention of this plant as an herb. So this year, when it began to pop up all over my garden I was okay with it. 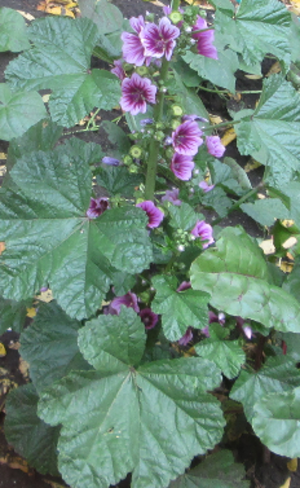 In the last fall weeks, as I was cleaning up my garden for the winter, I saw that these malva plants were thriving and looking so healthy and beautiful - I just hesitated to pull them up. Suddenly I decided that I should go back inside and check online to see what malva plants are good for as herbs. It hadn't really occurred to me to do that before. In no time at all I came out excited again, with an ice cream pail and began to harvest the leaves off the plants. I've already dried two batches on my dining table, and want to gather another batch. Why? Well, those leaves and flowers are terrific as a tea, or a compress, or even in a salad. They are soothing in skin care products, and can draw toxins out of pimples and abscesses, and relieve superficial burns. The ingredients in malva are mucilage, tannins, and malvin, which is a red pigment. It also has a precursor to vitamin A. The proper Latin name of malva is Althea sylvestris. It is found all over the world, and in most parts it is known as mallow. In the USA 'malva' is used more often to help it stand apart from the marshmallow plant. Malva comes from the Greek "malakos" meaning soothing. try it on rashy, itchy skin too. Make Malva Tea - by pouring boiling water over a teaspoon or two full of dried malva leaves and flowers. Cover the cup or teapot to steep for a while. Drink up to three cups a day. Make a Malva Compress - by using twice as much dried malva leaves and flowers (2-4 teaspoons), and steeping as for tea, then dip clean cloths in the boiled liquid and lay on the skin. A warm compress will be soothing to sore breasts. This Basic Malva Compress liquid could be used as vaginal douche, as long as you don't have yeast or an infection, or are pregnant. You can improve the anti-inflammatory action by adding 5 drops of echinacea and 5 drops of arnica tincture to the compress mixture. But notice; this is only for external use. (Like, don't go crazy). Make a Malva Wine - by soaking 1 ounce of malva flowers in a pint of white wine for ten days. Strain, and drink in small sips for serious digestive/intestinal problems. Make a Malva Expectorant - mix 1/2 oz. of dried malva, 1 oz of dried marshmallow herb and 1 oz of fennel seeds. Put 1 to 2 teaspoons of that herbal mix in a cup of hot water and allow to steep. Together these herbs are slippery and loosen up phlegm to help you expel it. (If that phlegm goes down into your lungs you have pneumonia!). Personally, I don't care for the strong barnyard smell of marshmallow, so you might want to add a bit of honey to the steeping mixture. Strain out the herbs before you sip at the syrup. Malva Remedy for Colds and Hoarse Throat - mix 2 oz. dried malva and 1/2 oz. of mullein flowers. Put 1 to 2 teaspoons of this herbal mix in a cup of boiling water. Steep ten minutes and strain before drinking until your symptoms ease away. I confess I'm just learning about this herb, but having harvested some this fall, I hope to experiment with the teas, compresses - and - I want to see how malva works in my ointment recipe!